Playing an instrument is a beautiful thing, truly – it opens up and expands our souls, it makes us very welcome in virtually every sort of company, and it really does feel pretty good. Now, there’s a very special reason why acoustic guitars are a ‘weapon of choice’ for most modern-day musicians. They’re versatile, pretty easy to handle (the basics, for the very least), and you’ll be able to play virtually anything with them (the same can’t be said for, let’s say contrabass or trumpets). But of course, you’ve already made up your mind and we hope it’s safe to assume that you are here looking for the best acoustic guitars, right? If so, you’re most definitely in the right place. 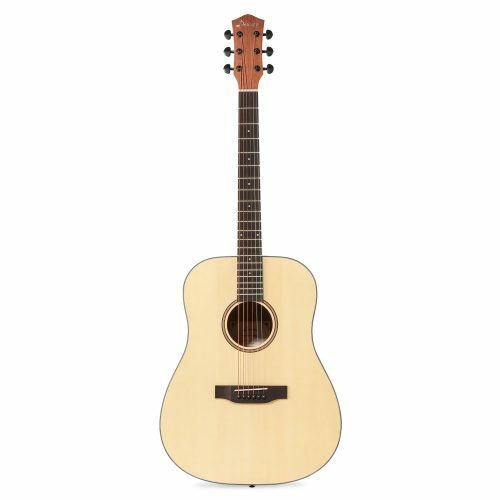 We’re here to offer you a broad selection of premium-quality acoustic guitars made by the best acoustic guitar brands out there – check out our reviews and the buying guide for additional info in the sections below, but if you just want a quick recommendation, the ‘quick pick’ should suffice’. Let’s get going. Since our reviews aim to provide as much information as possible, they’re quite lengthy, so you might need some time to browse through each and every acoustic guitar we’ve covered today. If you lack that time, the ‘quick pick’ should help you out in choosing a perfect guitar for you in mere minutes. First and foremost, if you’re after a classic well-rounded guitar, both Squier Dreadnought and CD-60S by Fender are formidable guitars and should do the trick. Similarly, the JR2 from Yamaha offers the same set of benefits and costs pretty much the same (main differences can be seen in aesthetics and price). Players who want to spice things up by amping their guitar would find Martin’s LX1E as valuable, to say the very least. Other guitars in our review all boast a superb price to value ratio, but the ones we’ve mentioned so far can easily be considered as the best of the best. The first of many premium-quality guitars we’re reviewing today is Fender’s Squier acoustic guitar. You’ve surely heard about the brand, but in case you didn’t, they’re pretty much one of the most famous (if not ‘the’ most famous) brands in the guitar industry, which is just one of the reasons why we’re opening up our review with the big guns. So basically, this is a relatively affordable acoustic guitar ‘bundle’ which comes supplied with a plethora of beginner features, but it’s also a guitar made of great-sounding tonewoods. Though it does come from a premium brand, it’s considered as one of the finest starting guitars available for the buck – it’s all around performance and plenty of complementary gadgets will most certainly help you nail down the basics in no time. Alternatively, even intermediate level guitarists, even veterans should consider it due to its warm tone and exceptional robustness. The first thing you’ll notice about Fender’s Squire acoustic guitar is the classic dreadnought body. Sure, it seems a bit bigger than an average acoustic guitar, but that’s precisely what makes it so good for beginners. It falls nice and easy on the lap, making up for its somewhat heavier construction with a great feel. Moving on, the top is made of laminated Spruce, the sides and back from laminated Nato material, and the fingerboard is made of high-quality rosewood. The diversity of materials here provide a rich, full sound and a bright, slightly warmer than average tone. Although not a key feature, it wouldn’t hurt to mention that this guitar isn’t ‘unfinished’ per se, rather it was reinforced with a ‘natural’ layer for extra durability. Last, but not least, the chrome-plated tuning machines provide excellent intonation and hold the tune quite well. As for the complementary features, there’s of course, a large gig bag, several Fender picks, ‘Austin Bazaar Guitar Essentials’ guide, a set of replacement strings, a strap, and a convenient little tuner. Generally, Fender’s guitars are held in high regard by almost everyone who knows a thing or two about instruments in general. Even right after unboxing it we knew that we were holding a premium piece, so we expected quite a lot from it. It’s true that it doesn’t seem like much in terms of aesthetics, but you’d be surprised at how rich the strings sound. The playability of Fender’s Squier is also amazing, which is precisely what beginners need to learn the ropes. With a slim neck and exceptionally mellow frets, you’ll be able to nail down single notes and chords alike with great ease. There’s no doubt that the playability combined with great-sounding tonewoods are Squire’s forte. On top of that, we really liked the addition of complementary features and the fact that it’s as good for beginners as it is for seasoned veterans. The ‘all-you-need’ bundle comes packing every necessary gadget an immediate beginner needs to start rocking straight off the bat, and all of that comes at a decently approachable price. Like we’ve mentioned earlier, this is primarily a beginner’s guitar. It does provide a lot of benefits, but it doesn’t particularly excel in any field of performance. There are models that look better, sound better, as well as guitars that could hold the tune for a little while longer, but that’s perhaps an obvious downfall of being so well-rounded. In a nutshell, Fender’s Squire is a wonderful starting guitar. It packs a huge value for the buck due to the fact that it sports premium-quality materials, sounds awesome, and sports an impeccable level of playability. Great for people who’re on a tight budget. Here we have yet another premium-quality guitar from Fender, and this one’s a Dreadnought as well. If you’ve checked out our review of the ‘Squire’, you’ll notice that there are a lot of similarities between it and the CD-60S. Nevertheless, there are also a couple of crucial differences which made us introduce this particular model into the fray. 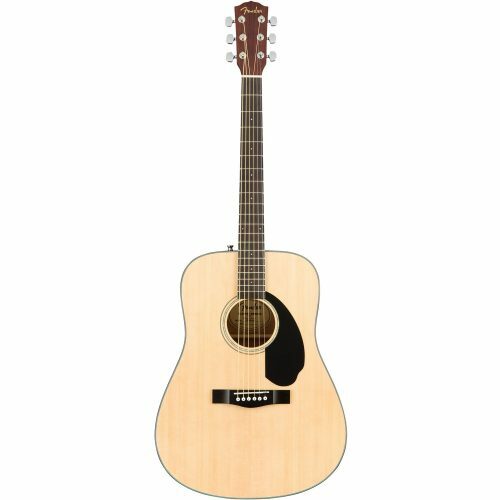 Just like the ‘Squire’, the Fender CD-60S features a Dreadnought body, a top made of solid Spruce, and a rosewood fingerboard. Now, the first difference between the two is the high-gloss finish, which makes the latter just slightly more ‘attractive’, or so to speak. Despite having a relatively similar set of main specs, the Fender CD-60S also features a rosewood bridge and a compensated saddle, which means that it does a better job at holding the tune than the former. Lastly, this particular model is pretty cool for beginners, but it’s not primarily a ‘starter’ guitar, unlike ‘Squire’. It also sports a similar set of complementary features, including a strap, two picks, replacement strings, and a tuner (notice that Guitar Essentials guide is excluded). Initially, we already said that most people should expect quite a lot out of Fender’s guitars, and Fender CD-60S is not an exception. It’s a great guitar with an awesome potential, although it does cost a few bucks more than ‘Squire’. As it’s common with ‘guitar bundles’, we were more focused on testing out the guitar, as we knew that the extra features don’t play such a vital role (as they can be more easily replaced). Turns out that CD-60S holds the tune even better than Squire and produces a richer, brighter tone. There’s a strong possibility that the latter is provided by a different set of factory strings, though. The ‘versatility of Fender guitars’ is a broad topic, the one which we could discuss for hours, if not days. That’s also a thing that we liked the most about the CD-60S. It will sound great in the hands of a professional, it will sound great in the insecure hands of a beginner. Chords are as easy to play as single notes, and we shouldn’t take solos out of the equation as well. To top it all, there’s the high-gloss finish which accentuates the massive beauty of this extraordinary guitar. What’s more, the action of this guitar is perfectly suited for beginner players. It’s a great compromise between good intonation and playability, meaning that it’s neither too high or too low. There’s just one thing we didn’t like about CD-60S – the pins on the bridge are quite hard to remove. This is, however, most certainly not a deal breaker, as most beginners wouldn’t even get to dabble with such technical stuff, but should you need to replace, upgrade, or in any way tinker with the bridge, prepare for some tough time. Even though it’s true that you won’t see a prominent guitarist packing the CD-60S, it’s definitely a formidable guitar, even if we’re to take out the fact that it’s a budget beginner guitar. It rocks a great value for the money and does precisely what it was meant for. Right after a couple of Fenders, we’ve decided to take a gander at one of Yamaha’s guitars. Among the guitar enthusiast community, there’s a lot of praise for this brand, and it’s quite safe to say that they’re sitting upon the same pedestal as Fender. Now, there are a couple of things that Yamaha engineers do a bit better in terms of acoustic guitar making – they build their acoustic models smaller and thinner, which in turn heavily affects the portability and sound. Whether you’re going to love it or hate it, it’s up to you, but it goes without saying that almost every Yamaha guitar is exquisite and unique, and JR-2 is definitely not an exception. First of all, this is a ‘junior guitar’, which means that it’s best suited for teenagers and students. It packs a 21,25-inch scale length and it’s among the most portable, yet quality acoustic guitars you’ll find in the price range. That being said, guitarists who like to frequently travel should definitely consider it, especially due to the fact that it comes with a complementary gig bag. Its top is made of spruce, the back and sides of mahogany, fingerboard, and bridge are made of rosewood, and the neck is made of Nato materials. Now, although these materials are quite common, it’s important to note that the back and sides were purposefully made to be ultra-thin, which means that the level of playability of this guitar is through the roof. Another great thing about Yamaha’s JR2 is that it comes with a set of extra strings, three picks, Austin Bazaar’s Guitar Essentials beginner guide, and a tuner, all completely free of charge. Even though it’s true that Yamaha is a great brand, we knew that a junior-sized guitar won’t be to everyone’s liking. Right out of the box, we did a couple of sound tests and deduced that its tone is, for the lack of better words, satisfactory considering the price. On a brighter side, this guitar being petite in size is very transportable, which is certainly a big plus. Combined with a plethora of gratis features, a beginner will have everything needed to start playing at his (or her) disposal for very little cash. This is definitely one of the best acoustic guitars available for the buck. Let’s begin by saying that we really liked the price of Yamaha’s JR2. In general, it’s a great guitar from a world-class brand that doesn’t cost much at all, so it’s safe to say that you will be able to save up just enough cash in about a month or so. On another hand, it sounds pretty great, and its playability is unparalleled due to ultra-thin back and sides. Though it’s made of relatively common materials, this choice of tonewoods works incredibly well in synergy. Last, but not least, let’s not forget the gratis features you’ll get with this bundle. It’s true that you’ll be able to get all of these gadgets for some $10 to $15, but this way you’ll spare yourself the hassle of picking individual accessories. Despite being pretty versatile and incredibly portable, there are a couple of things that JR2 lacks. For instance, the sound it provides is kind of unimpressive considering that this guitar was made by Yamaha. On another hand, its smaller profile makes it ideal for beginners – not so much for advanced players, let alone professionals. Lastly, this guitar would welcome a bit of extra bass, as it’s all but pronounced and present. Truth be told, Yamaha’s made better guitars, but almost all of them cost a fortune. That’s not the case with JR2, as it belongs to the ‘affordable’ price point category. Additionally, it’s very portable, and you’ll notice that playing on it is easier than most other guitars. It’s true, however, that due to its smaller size it would sit better in the hands of a beginner than an intermediate level player, but it’s still a formidable guitar for the money. Now, Martin might not be as famous as Fender or Yamaha, but we can assure you that they’re not too far behind each other. This is a reputable, well-renowned brand that’s made a lengthy series of premium-quality guitars, and the LX1E happens to be a true representative of their craftsmanship. Essentially, this is the first semi-acoustic guitar we’re reviewing today. Among a variety of exceptional features, it also numbers the bleeding-edge Fishman Sonitone electronics, making it perfect for musicians who perform live. Apart from being the first semi-acoustic guitar in our review, Martin’s LX1E is also the first ‘standalone’ guitar we’re covering today. It doesn’t come with tuners, extra strings, picks, and what not, but it does, however, come supplied with a gratis gig bag (though it’s pretty generic, it’s not padded or anything such). 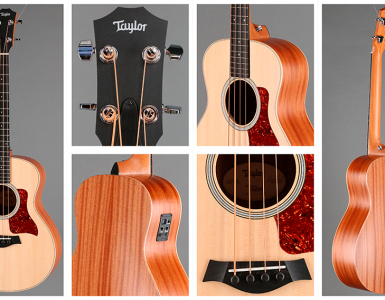 Now, the first notable feature of Martin’s LX1E is the modified Rust Birch neck. It was specifically ‘tailored’ to provide additional durability without hindering playability in any way. Moving on, the top of this guitar is made of solid spruce, the back and sides are made of quality mahogany, and there’s a set of chrome plated tuners which do wonders for the intonation. Frankly, Martin is a curious brand, a ‘jack of all trades’ of sorts. Apart from making quality guitars, they also make wall heaters, barbecue grills, and tools of all kinds, so we were initially quite puzzled about what we should expect (from a brand that doesn’t really specialize in guitar manufacturing). Setting all of our prejudices aside, we’ve decided to see how it performs in action, and you’ve probably guessed it since it managed to find its way in our review – it performed flawlessly. 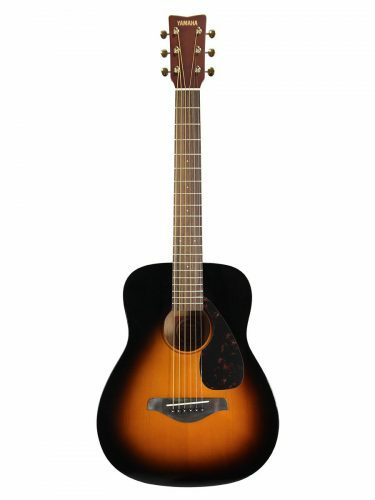 The sound this guitar provides is a level or two above the models from Fender and Yamaha we’ve seen so far, but the price is a bit higher as well. The sheer acoustics were phenomenal, and we have nothing but words of praise for LX1E’s playability, intonation, and action. The electronic hardware, on the other hand, is what made us decide to include it in our review of the best acoustic guitars you can find on the market. To put things simply, Martin’s LX1E looks quite straightforward, but it’s all but plain. Aside from ‘not excelling in aesthetics’, it boasts an incredibly rich tone, its medium action is absolutely perfect for guitarists at all skill levels, and you won’t need to tune it so often due to premium-quality chrome-plated tuners. We’ve really liked the electronics Martin used, as you’ve probably figured already, but we simply need to accentuate how awesome this guitar sounds when plugged into an amp. Combined with airy, resonant acoustics, this guitar is a dream come true for live musicians and performers. There’s just one thing we thought could be improved in regard to Martin’s LX1E – the price. Even though it does provide a broad range of benefits – from exceptional sound, over perfect action, to exceptional electronics – it’s still a bit expensive. For contrast, let’s compare it to Fender’s Squire – the former costs only half as much, yet it comes supplied with a plethora of complementary features, whereas Martin’s LX1E only packs a gratis gig bag. Nevertheless, the models we’ve seen so far are all ‘budget’ acoustic guitars. The LX1E is close to being in the ‘boutique’ level, which means that beginners should probably consider some other model. 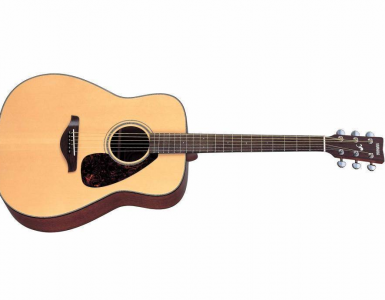 If you have the money, we strongly suggest that you at least consider Martin’s LX1E. It’s a wonderful guitar, even when not plugged in, as it rocks top-shelf acoustics and premium-quality components. Though it does cost a bit more than average, it brings a lot of benefits in order to compensate for its price. This might be one of the best acoustic guitars ever built. Next up is Donner’s DAG-1. Now, you’ve certainly heard about Fender, you might’ve heard about Martin, but if you’re not a real guitar enthusiast, there’s a strong chance you’ve never heard about Donner, so let us fill you in quickly. These guys are on the market for quite a while and they mainly deal with all kinds of electronics, guitars and guitar accessories included. Now, though they’ve earned their fame with budget pedals, for the most part, they’ve actually done a solid job with acoustic guitars as well, hence we’re doing a little review on their DAG-1 beginner acoustic guitar. Just like many models we’ve covered so far, Donner’s DAG-1 is a beginner bundle comprised of a high-quality full-size dreadnought guitar, a gig bag, four picks, a cleaning cloth, some replacement strings, a guitar capo, a tuner, and a strap. As for the guitar, it packs a spruce top and mahogany body, the neck is also made of mahogany, and what’s curious is that the fretboard is made of premium-quality ebony. The reason why this is so peculiar is because budget guitars are seldom outfitted with such exotic elements. Overall, the features of DAG-1 are quite impressive, even if we’re to completely neglect the fact that this is both a budget and a low-cost guitar. It’s true that Donner doesn’t boast as much renown as Yamaha and Fender, but we’ve heard about them quite some time ago. Even initially we knew that we should expect much, as these guys know what they’re doing, and they’re doing it right. Though this might not be one of the best acoustic guitars ever, it’s definitely among the finest models in the affordable price point category. The gratis features are in abundance with this bundle, that’s a given, but we were mainly interested in the guitar, especially the Ebony fretboard. Now, apart from looking classy, we’ve established that this guitar provides a formidable sound for the buck – nothing exemplary, but certainly far from being bad. The durability is on point as well – the hard casing of DAG-1 is as robust as can be, and we’re certain that Donner engineers built it to withstand quite some punishment. The playability was pretty decent, and the same can be said about the action. Truth be told, it’s fairly hard to find a well-rounded acoustic guitar in the budget section. Donner’s Dag-1 is pretty versatile, meaning that players at different skill levels can make use of it, and to top it all, it comes packing a broad list of gratis features. It’s sturdy, it’s durable, and its sound is way above average considering the price. Speaking of which, we were actually quite amazed at how affordable this guitar bundle is. Being an all-around guitar, the DAG-1 doesn’t particularly excel in any field of performance apart from sheer sturdiness. It’s big and heavy, but it can withstand an accidental fall or two, the materials are pretty great, and it’s true that it sounds rather nice. However, most of the gratis features (aside from the picks and the cloth) are of rather cheap quality. The action is also a bit too high for beginners, and the tuning pegs require you to tune this guitar back in quite often. Considering that this is a budget guitar, this was all expected, in truth. The words that would best describe Donner’s DAG-1 are ‘it’s a piece of work, but it’s well worth it’. You’ll have to go through the hassle of re-tuning it every once in a while, and you’ll need some time to adjust to the slightly higher action, true. However, the silver lining is that this guitar offers the same set of benefits as most mid-priced models. We highly recommend it. Just like Donner, Stagg is also a ‘versatile’ brand. They’re making xylophones, table chimes, hi-fi headphones, foam windscreens, but they also deal with zipper ties, network cables, mandolin stands, and, as funny as it sounds, they’re making and selling their own chili. Now, before we get to the part of ‘what’s a guitar doing in their assortment’, let’s just be clear on one point – these guys are a large company, and their guitar engineers know what they’re doing, as you’ll see in the sections below. 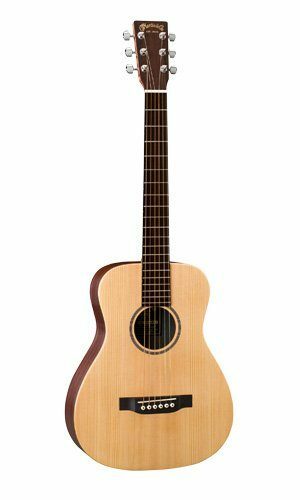 In a nutshell, Stagg’s SW201 is a ¾-scale acoustic guitar for left-handed people. We thought that left-handed folks deserve a pick for them alone, so if you’re right-handed, you can feel free to skip through this particular review. There’s one thing you’ll notice about Stagg’s SW201 before anything else is how beautiful it looks. Our guess is that Stagg’s engineers purposefully wanted to accentuate the beauty of their tonewoods, which is perhaps the reason why this guitar is available in four different colours – blueburst, black, natural, and pink. Though it’s definitely not a professional guitar, the SW201 comes supplied with a set of formidable features. For instance, the full-basswood body is durable, but it also contributes to the awesome acoustics this guitar provides. Expect a punchy, bass-heavy sound. Additionally, there’s a set of die-cast chrome plated tuners onboard which provide plenty of sustain. What’s more, the intonation qualities of this guitar are well beyond average. In essence, this is a budget guitar and was initially treated as such. We didn’t think it could go toe to toe with Fender or Yamaha models (let alone Martin), but in terms of sound, it turns out it actually can. Speaking of middle range and bass this guitar emits, it’s at least in the range of Donner’s DAG-1, if only slightly inferior. That means that it’s still a pretty decent guitar, not to mention that we didn’t forget that it’s a budget model. Its durability isn’t anything special, but it will survive a couple of years of extensive use. Though it doesn’t come in a bundle (unlike most of our picks), Stagg’s SW201 is equally valuable as any ‘starter package’ we’ve covered so far. With beautiful aesthetics and unique tone signature, we’re positive that most similarly priced guitars are pretty far behind it in terms of all-around performance. It comes in several colors too, which is definitely a plus – there’s even a ‘pink’ model for the more beautiful part of the populace. Overall, its great sound and its amazing outlook are the two things we liked best about it. 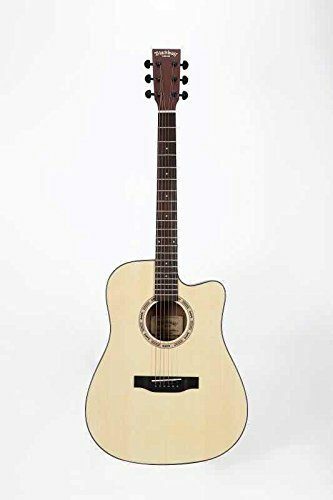 The playability of this acoustic guitar is pretty okay, considering that the frets are slightly bigger and come with tipped edges, but its action, on the other hand, was not to our liking (from a beginner’s point of view). Of course, if you’re a seasoned veteran you’d actually even be able to utilize the slightly higher action for the sake of better sound, but most beginners don’t quite like being forced to press on the frets with more strength in order to pull off a note (let alone a chord). Left-handed people are, sadly, a minority when compared to right-handed players, so our verdict will probably appeal to but a few of our fellow readers. Regardless, if you’re looking to score a quality lefty, Stagg’s SW201 is the way to go – great sound, decent playability, and excellent aesthetics are just a few of the things it brings to the table. Black Wolf’s beginner acoustic guitar is a cutaway full-body guitar bundle which comes with a set of neat complementary features. Essentially, this is one of the cheapest acoustic guitar bundles you’ll find, which is one of the most notable reasons why we’ve included it in our review. This guitar packs a solid spruce top, the back and sides are made of mahogany, it rocks a Scalloped bracing, a rosewood fingerboard, and a body made of solid mahogany. Though it doesn’t really excel in sound or aesthetics, it’s pretty versatile and best suited for beginners due to its high playability and lightweight construction. The complementary features include a set of replacement strings, a replaceable (and removable) pickguard, several picks, a guitar capo, a tuner, and a polishing cloth. Black Wolf is an underdog brand which is relatively obscure (and by relatively we mean almost completely, with the exception being the circle of die-hard guitar enthusiasts), so we initially thought that this bundle isn’t really much. Now, we’ve found out about this beginner bundle on Amazon, it’s actually one of the so-called ‘Amazon’s Choices’ in the 41-inch acoustic guitars department – a whole lot of people liked it, so we’ve decided to give it a go. Considering how cheap it is, it’s safe to say that it rocks a tremendous value for the buck. Despite having a toy-like level of durability and sounding pretty much the part, its playability and intonation are pretty cool. Let’s face it, brands are literally forcing their way on the market of ‘beginner gear’, so you’ll find bundles such as this wherever you go. However, not many brands will offer you the sweet price like Black Wolf. On another hand, this particular model has it all – though it doesn’t really excel in any field of performance, it sounds decently good, it can withstand a bruise or two, and it will remain in tone for at least a couple of days of playing. Well, if we’re to forget that this is a beginner’s guitar bundle (and a remarkably cheap one), we’d say that there’s plenty of room for improvement. There’s almost no bass feeling whatsoever, the mids aren’t too pronounced, and the highs are perhaps too crispy for comfort. Furthermore, you’d do good to pay extra attention when handling this guitar, as it isn’t the sturdiest model ever built. It’s cheap, but it’s good. Black Wolf’s acoustic guitar package is something you’d want to consider if you’re seriously low on cash and if you wanted to pick up this instrument for some time. Other than that, we recommend other guitars in this review if you have the money. Even though you might not be in the guitar world for long, Oscar Schmidt is the name you’ve seen or heard at least a couple dozen times by now. This brand is deeply respected by the entire community (newbies and pros alike), but there’s just one thing about them that makes them a bit elusive for beginners – their guitars are often quite expensive. That, however, suffers a couple of exceptions, such as the OG1. 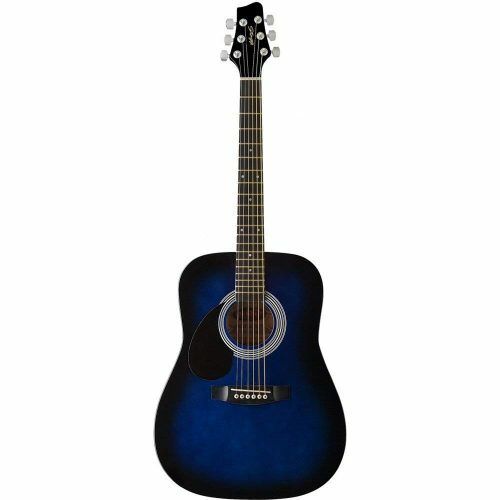 This is a beautiful acoustic guitar which is well suited for all styles of playing and virtually all music genres. Its ¾-size also makes it a bit more friendly for immediate newcomers, so if you’re one, make sure to not miss out. Just like we’ve mentioned, this is not a full-size guitar, rather it’s a ¾ one. It’s perfect for students and teenagers, although the classic body it rocks could be used by children as well. It packs a high-gloss finish atop its already beautiful design – we’ve ‘wasted’ quite some time on this eye candy, especially due to the fact that it comes in five colour variations. Its top is made of select spruce material, and its back and sides are made of exotic Catalpa. Now, it’s common knowledge that Oscar Schmidt’s engineers are unmatched artisans of their craft, so don’t get the wrong idea by thinking that this guitar might be flimsy since it’s all great looking and fancy – it is, in fact, as durable as a budget guitar can be. On top of that, there’s a set of fully chromed die-cast tuners which hold the tune remarkably well, as well as fully-adjustable truss rod. Frankly, you simply have to expect a lot from Oscar Schmidt guitars. These guys have made a ton of premium-quality models such as for example OE20B, OG2SM, and OG10CE that OG1 had a lot of proving to do. The sound checks were pretty straightforward – we strummed along the open notes to find that the acoustics were phenomenal, and when we started to pull off several chords we got the gist of how this guitar actually sounds like. It turns out that our first assumptions matched our first impressions – the OG1 sounds like a beast. A budget beast, though, since the quality of sound this model boasts can’t even begin to compare to what Oscar Schmidt can really do. It’s beautiful, and by ‘beautiful’ we mean, ‘out-of-the-earth’ beautiful in a very plain way. People who value simple things will agree. On another hand, if you’re looking for something a bit more wild, this model is available in pink, transparent blue, transparent red, and flame yellow burst colour options. Apart from aesthetics, this guitar excels in sound quality, durability, and playability – everything a beginner needs, and more. There’s just one thing that this guitar doesn’t have, and although it’s not a fatal flaw, it’s pretty obvious – the bass notes. Namely, the lowest strings sound as if they were palm muted at times, which is not something a beginner will get a feeling for straight away. There’s just one verdict one could pass onto an Oscar Schmidt guitar – it’s well worth the money. Actually, it would be a real shame to pass up an opportunity to try Oscar’s quality, especially since they have several models in the budget range. Needless to say, if it’s quality you’re after, they offer it by the bulk. We are slowly nearing the end of our review, so let’s have a quick step back and remind ourselves what Yamaha’s engineers are capable of. Here we are looking at FG800 bundle – a serious gig-ready package by one of the world-class leaders in the industry. Basically, this bundle is slightly different from our first Yamaha starter pack since it comes with a premium hard-shell case, but the guitar that comes with it is also substantially different in terms of both performance and materials. Yamaha’s FG800 features a top made of solid spruce materials, but what’s really interesting is that back and sides are made of exotic Okume material. This combination of tonewoods results in a full, rich sound characterized by warmness and brightness all over. There’s the traditional dreadnought body Yamaha simply loves to implement in their guitars, and the only other thing worth mentioning is that you can have this particular model in ‘natural’ and exclusive ‘black’ colour variations. We’ve already said that when it comes to Yamaha, you should expect a great deal, and the same applies to the FG800 bundle. Now, this time around it was a bit different, since this beginner’s pack is slightly more expensive than the one we’ve covered in the sections above. Namely, this model looks a bit more elegant, the exotic materials used in the manufacturing process provide even more durability (atop the already high standard of Yamaha guitar’s sturdiness), and the sound was something else entirely. Though we did expect a lot, we were still quite surprised that such a well-rounded guitar was to be found within the ‘affordable’ price point category. Basically, there were plenty of things we liked about this guitar. The choice of tonewoods was great, the sound it provides is awesome, and not to mention how stylish it looks. On top of that, Yamaha’s engineers even used their brand new scalloping to further enhance and bolster the sound, so it’s safe to say that that was the thing we liked the best. Now, though the bundle comes with a series of high-quality guitar accessories and tech, we really liked the hard-shell case. It’s true that the FG800 is very durable, but you’ll be able to even further prolong its lifespan by keeping it safely tucked away in this complimentary storage. The frets are decently spread apart, so it’s safe to conclude that FG800 has a high level of playability, sure, but what we didn’t like as much is how the strings (factory strings, though) fall in line. Some players think that it’s a bit harder than average to play a chord, others point out that the action is slightly off. Regardless, you’ll need some time to get used to how FG800 feels. Now, Yamaha is a huge brand, better yet a huge name in the industry, but let’s not forget that this is actually a beginner’s bundle. The sheer fact that it comes with Austin Bazaar’s instructional video confirms it, so before we get to the point of passing a verdict down, let’s attune our expectations. First and foremost, the FG800 can’t really compare to other Yamaha guitars in terms of performance and sound – it’s playability and intonation aren’t, well, perfect, but there are numerous benefits waiting for those who give it a go. In a nutshell, this is an awesome guitar, or better yet – an awesome starter bundle. It is a bit more expensive than most starter kits we’ve covered, but it’s well worth the money. We’ve begun our review with a Fender, and now we’re closing down the curtain with another one – the FA-115 Dreadnought. This one’s not too special when compared to other Fender guitars, but it boasts a huge value for the buck due to its exceptional performance and the variety of bonus features it comes supplied with. Classic dreadnought body – check. Spruce top and X-bracing – check. What are the other great materials Fender used for this extraordinary guitar? For one, the back and sides are made of quality basswood, which is not exactly ‘common’ with Fender guitars. Additionally, the bridge is made of hardwood, and the fingerboard is made of rosewood, packing 20 perfectly sized frets all the while. The natural gloss finish is just one of the many things that make FA-115 looks so amazing, but even if you don’t like the ‘sunburst’ edition, there are four other color options at your disposal, including black, natural, squire natural, and squire sunburst. You simply can’t ‘not love’ Fender guitars – there’s a very special reason why these guys have made it to the top, and that’s because they know what a guitarist needs. Those who want good sound packed with durable construction and a beautiful outlook are searching for a Fender guitar, and luckily, the FA-115 has it all. Frankly, we couldn’t leave this model out when we found out that it packs such a formidable set of tonewoods – the hardwood bridge rocks a compensated saddle for ultimate intonation, the basswood back and sides provide the much-need punchy feel to the lows, and the x-bracing further enhances the overall sound quality. All in all, this one’s as close to perfection as you can go in the budget price point category. Just like with our previous Yamaha pick, this model packs a hard-shell case, so storage will certainly not be a problem for you. If you remember our review of the Fender CD-60S, you’ll notice that we mentioned that its only problem was the hard-to-remove pin on the bridge. Well, guess what Fender didn’t improve with this model? Fender’s guitars are premium, they’re at the top of the ladder, and FA-115 stands on top of the ‘budget’ price point range. If you’re low on cash, don’t hesitate – this model offers you an opportunity to jam like a rockstar for a shamefully low price. Though we’ve already recommended some of the best acoustic guitars on the market, it wouldn’t hurt to understand the criteria we used while deciding which model is and which isn’t. This section is dedicated to helping you figure the vital elements of the best acoustic guitars. Materials, or tonewoods , in this case, are one of the most important factors you should consider. What materials were used in the manufacturing process of a guitar is what determines the overall quality of sound, as well as its durability. Some of the most popular material types used in the construction process of an acoustic guitar are Spruce, Cedar, Mahogany, Maple, and Rosewood. Spruce is commonly used for the guitar’s top part. You can easily recognize it if the model is ‘unfinished’ by its characteristically pale colour. The reason why most brands use Spruce, in such a way, is because it doesn’t really have any drawbacks to it – it works cool in combination with pretty much any other type of tonewood, and it has an awesome projection while complementing the acoustics and reverberations. One of the most common Spruce sub-species is so-called ‘Sitka Spruce’. Brands that use it are well aware of its availability and cheapness, but they mainly use it because it’s versatile. You’ll hardly find an ‘All-spruce’ guitar, though, as this type of wood generally doesn’t provide a characteristic sound signature. There are a couple of things we could discuss about this type of tonewood. Generally, as we move further from ‘popular’ tonewoods to ‘more exotic’ ones (figuratively speaking), you’ll notice that the bridge between ‘pros and cons’ will be more pronounced, leaning towards extremes all the while. Now, let’s get back to the benefits and drawbacks of Cedar. First and foremost, Cedar simply looks better than Spruce. Apart from that, this type of wood is significantly more ‘flexible’, for the lack of better terms. That means that it emits a bit quieter tone, which offers less sustain, but provides more warmth. 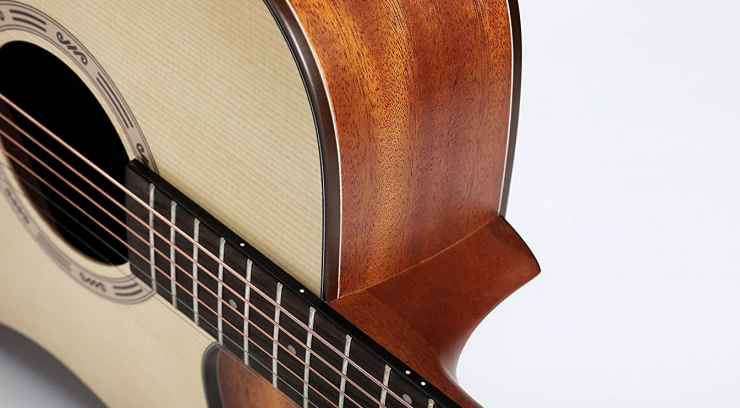 While cedar and spruce are commonly used in the manufacturing of the guitar’s top part, mahogany is widely used for back & sides (there are exceptions though, as mahogany top guitars could sound well if other tonewoods are picked properly). The reason for that being so is because mahogany doesn’t really sound as bright as the aforementioned wood types. Now, mahogany is pretty dense (as opposed to Cedar’s flexibility), which means that guitar engineers use it to enhance the guitar’s projection, adding a bit of extra punch when needed. One of the best, as well as most widely used combination of tonewoods is Spruce top with mahogany back & sides – it offers a great balance between warmth, sustain, and projection. Maple was ‘made famous’ in the guitar world by Gibson several decades ago. This particular tonewood is not so popular mainly because it’s a bit more expensive in comparison to other tonewood types. Its main characteristics are unparalleled density, exceptionally bright tone projection, and superb note definition. This combination of characteristics yields two consequences – first, if you know how to combine Maple with other elements you’ll get a perfect guitar, and second, if you don’t, you’ll ruin your guitar. On a side note, Maple is considered to be as one of the most beautiful tonewoods ever, right next to Ebony, Rosewood, and Mahogany. Rosewood is among the least popular tonewoods, simply because it costs the most. It has a smooth texture, offers a warm tone, and visually looks absolutely amazing. Most brands combine rosewood with Spruce as a fair balance between cost-effectiveness and tonal qualities. This might be a decade-long question, if not more. Acoustic guitars are ‘normal’ ones while ‘semi-acoustic’ guitars feature an electric component (often simply referred to as electronics) which allows the player to plug them into an amp. When you decide whether you want a plain acoustic or a semi-acoustic guitar, there are a couple of things you should know about. First and foremost, semi-acoustic guitars are often significantly more expensive. The reason why that is that the ‘electronics’ usually cost more than most of the other hardware (even when combined). If the price is not an issue for you than semi-acoustic guitars would be as valuable to you as regular acoustic ones. Secondly, semi-acoustic guitars are usually made of ‘conventional combinations of tonewoods’. Don’t expect anything too fancy. Thirdly, people who are considering getting a semi-acoustic guitar usually end up buying an electric guitar instead, so keep that in mind. The reason why we’re discussing this topic is because we included several semi-acoustic models in our review, so keep our tips in mind when deciding. Even though this might sound obvious, there are many reasons why ‘beginner guitars’ are called that way. Certain factors, such as playability and guitar action determine which skill level you need in order to properly utilize the benefits of the guitar you want to buy. 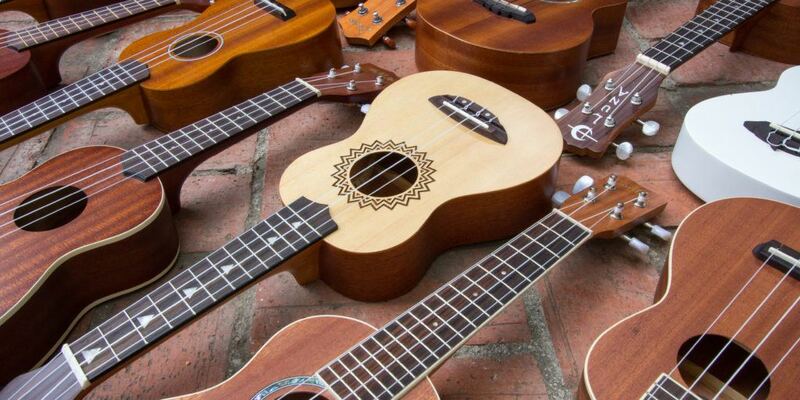 Since this one’s pretty straightforward, we’ll only mention that the basic differences between beginner guitars and guitars meant for players at higher skill levels (intermediate, advanced, pro, etc), revolve around how the fingerboard is made, and how the strings fall down on the frets. The playability of a guitar determines how easy it is to play it. Some guitars, especially those with a low level of playability, are only held once, as beginners either get dissuaded by the sheer amount of effort needed to play it, or by the fact that the guitar is simply way above their level. Tightly correlated to playability is the term action, but since it’s relatively simple to explain, we won’t dedicate an entire section for it. Now, the action determines the ‘distance between the strings and the fretboard’. Low action means higher playability at the expense of intonation, as you’ll need less effort to pull out a chord, but you’ll also make the strings ‘hang loose’, which means that you’ll need to tune in your guitar a bit more often. High action is what most professionals ‘use’ since it bolsters the intonation and doesn’t really bother them in terms of sheer playability. Beginners usually require a balance between the two, where the action is neither too high or too low. Intonation refers to ‘staying in tune’. Bad intonation will require you to tune your guitar as often as once (or more) per day, whereas good intonation means that your guitar will stay in tune for longer periods. The intonation is especially important when you’re a beginner, as you’ll have to go through the hassle of using tuners (which you are most likely to not be too familiar with) often, which might potentially dissuade you from playing by a long shot. With this, we conclude our review of the best acoustic guitars that are to be found on the market. We’ve seen some serious models from some of the best acoustic guitar brands such as Fender, Yamaha, Martin, and Oscar Schmidt, but we’ve also given the opportunity to underdogs such as Stagg and Donner. It falls up to you to decide which is the best acoustic guitar, but if you’re completely out of ideas, feel free to browse through our recommendations. Make sure to check out our buying guide for additional information regarding the criteria we used when we ‘passed on the final verdict’, but also to acquire some valuable info regarding the guitar basics, such as intonation, action, playability, guitar tonewood material types, and so on. Your GC247 Admin and Content Editor. Use the Contact Form or Comment section if you have any questions or suggestions for me.